Long before it became fashionable Charles "Charlie" V. Carr advocated local legislation designed at toppling long standing racial barriers. Charles "Charlie" V. Carr was a pioneer in the civil rights movement. He fought vehemently against racial discrimination in Cleveland's public places. ﻿In 1948 he was the motivating force behind legislation mandating that amusement parks, public dance halls and roller rinks be open to all races. His home was bombed as a result. In 1950 Charles V. 'Charlie' Carr was gifted a gold watch for his introducing of the FEPO Ordinance (Fair Employment Ordinance)﻿﻿ in Cleveland, Ohio by his grateful constituents in what was then the 17th Ward of Cleveland. FAIR HOUSING PIONEER Charles V. Carr was in the forefront of many other local civil rights movements, and fought for a fair-housing ordinance as early as 1960. 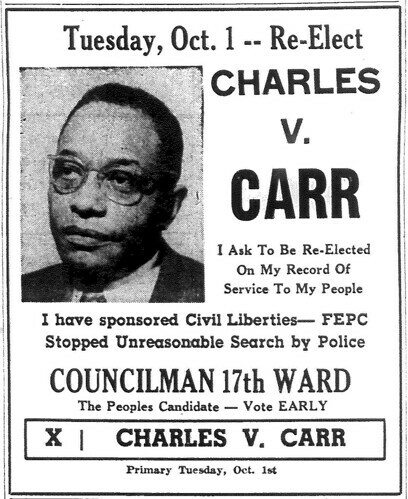 Charles V. Carr was a civil rights lawyer and Democratic politician in Cleveland, serving on the City Council from 1945-1975. 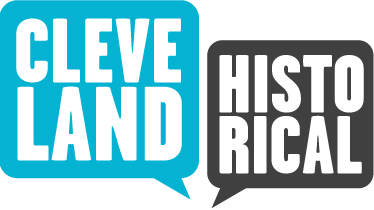 He fought vehemently against racial discrimination in Cleveland's public places. Carr authored the amusement park anti-discrimination ordinance that was passed by Cleveland City Council in February 1947. Image Courtesy of Cleveland State University. Michael Schwartz Library. Division of Special Collections. Cleveland Press Collection. Charles V. "Charlie" Carr began a general practice of law in Cleveland, Ohio in 1930 after taking an oral Bar Exam. He and remained active in the practice until his death in 1984. 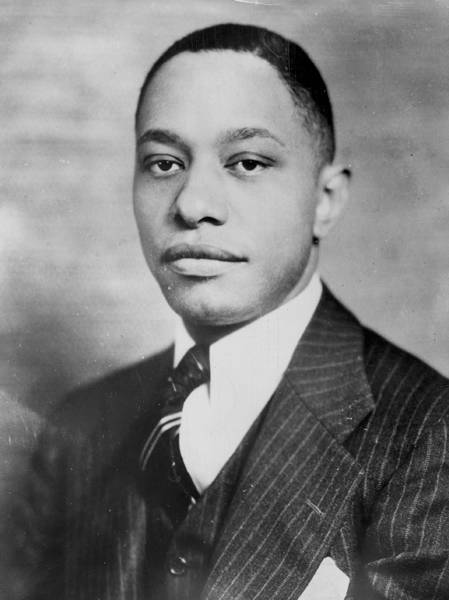 Charles V. "Charlie" Carr was appointed Assistant Law Director and Police Prosecutor for the City of Cleveland in 1941. Charles V. "Charlie" Carr, opened his law practice in 1930. Charles V. Carr,Leo Jackson and Lawrence O. Payne established one of the first, if not the first, black owned law firms in Ohio in 1954. Lawrence Payne had established the Call and Post Newspaper, along with William O. Walker in 1940. Judge Lloyd O. Brown, an Ohio Supreme Court Justice, started his law career with Charles V. Carr as an associate and then partner in his law office. Eventually he went on to practice with Weston, Hurd, Fallon, Paisley and Howley on the 4th floor of Terminal Tower. Lee Howley was Charles V. Carr's good friend. Attorney Charles V. Carr was admitted to practice practiced before State and Federal Courts. He served as Attorney for Shiloh Baptist Church﻿﻿﻿﻿ and many other Cleveland Institutions.